Play game show-style on a 3D game board. A variety of draw tools, colors and brushes provide the freedom to sketching victory! With seven new draw modes and a custom game board, Pictionary Mania adds a whole new twist. Utilize the drawing tools to create colorful masterpieces. The newest way to play Pictionary! Over 3,000 clues. Draw with several drawing styles, shape tools and colors. 3 Game Modes, Pictionary game show, Pictionary Mania, & Free Draw. Pictionary, Be contestants on the Pictionary game show with new drawing tools, new Adult and Junior clues, and a 3D game board. 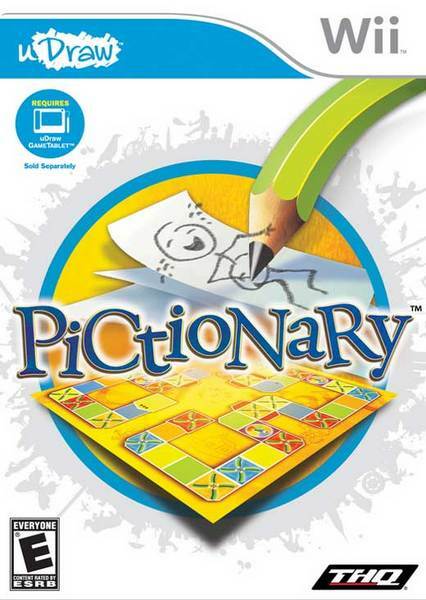 Pictionary Mania, Experience Pictionary like never before. Instead of categories, each square represents exciting draw modes, some only available on the Wii. Free Draw, Embrace your creativity with your own drawings that you can share in Slideshow mode.